Door (Small Samsung Samsung SHS-H635 FMS Digital Door Lock, RFID Keyless with Mortise (Small AML-220) Lock. 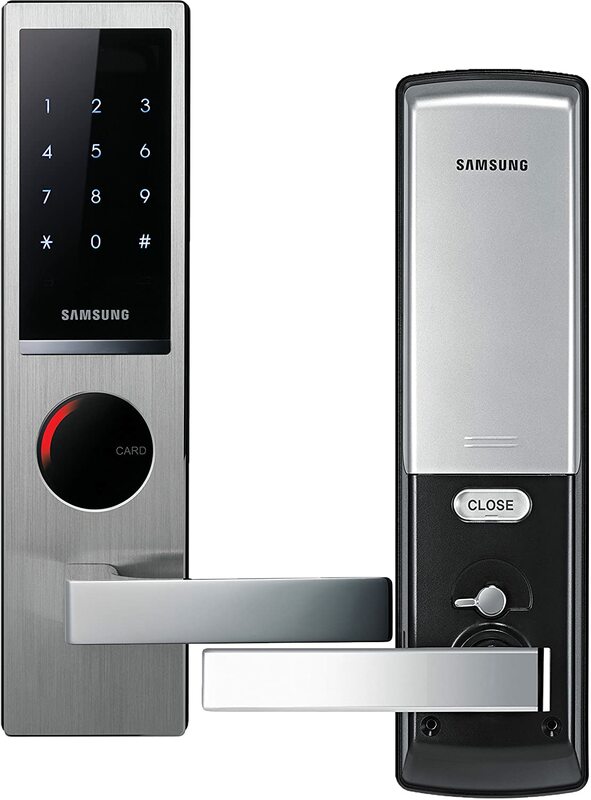 About The Door (Small Samsung Samsung SHS-H635 FMS Digital Door Lock, RFID Keyless with Mortise (Small AML-220) Lock. EASY TO USE � Use the digital touchscreen numeric keypad to enter a password pin or RFID faster than you can turn a key. Handle levers can flip to either the left or right side. Battery operated with emergency power contact. Size: SHS-H635 FMS (Small Mortise) DETAILS � Program 1 master pin and up to 20 RFID tags. DESIGN � Samsung door locks have a sleek modern design which would complement any interior or exterior door in the residential home, apartment, or commercial business office building. SECURITY � Rigorously tested construction, random security code feature, bump and pick proof, intrusion alarm, PSB fire tested and fire detection sensor, anti tampering lock out. Compatible with certain NFC items. The mortise is electronic for faster open/close and has the added security of a latch. MORTISE � Sturdier and more durable than cylindrical deadbolt locks but do require door modification. Shut the door and the mortise sensor auto locks the door for you. The lock has your back.